Face scrubs are cleansers filled with little exfoliating scrubbers that can gently smooth skin. They can transform dull, dry skin by removing dead skin cells, hydrating the skin, shrinking pores, and preventing acne. They can also boost the absorption of skin care products and even make it easier to apply makeup. The St. Ives Naturally Clear Blemish and Blackhead Control Scrub (two-pack) is a cult classic for a reason. The creamy, oil-free base gently exfoliates, purifies, and nourishes the skin with beneficial ingredients like salicylic acid and 100 percent natural apricot extract, corn kernel meal, and walnut shell powder. The intense exfoliator gently cleans pores, promotes skin cell turnover and regeneration, and helps prevent breakouts and blackheads. It removes dirt, oil, and dead skin cells, leaving soft, smooth, healthy skin behind. The dermatologist-tested scrub is hypoallergenic, sulfate-free, paraben-free, and non-comedogenic. It works with all skin types, including acne-prone skin. It's an Amazon best-seller, Amazon's Choice for face scrubs, and recommended by TotalBeauty and Glamour. It also has outstanding online reviews, including more than 13,100 five-star reviews on Influenster. The Simple Kind to Skin Smoothing Facial Scrub (three-pack) gently scrubs away dirt, oil, and dead skin cells with natural rice granules. It's made with triple-purified water, Pro-Vitamin B5, and vitamin E, which can invigorate the skin and provide instant hydration. It also leaves the skin's natural barrier intact so the skin doesn't dry out. This works on all skin types, including sensitive skin. It's hypoallergenic, non-comedogenic, pH balanced, and has no harsh chemicals, artificial perfume, or dyes that can irritate the skin. It is an Allure "Best of Beauty" Winner and is recommended by Glamour and InStyle. The ACURE Brightening Facial Scrub uses the power of the ocean to naturally exfoliate skin. Organic sea kelp and lemon peel gently exfoliate skin, French green clay cleanses and removes dirt and excess oil, and Madonna lily stem cells brighten the skin. The rough scrubbers work to gently brighten complexion, restore cells, and stimulate new cell growth with argan extract and chlorella growth factor. This organic face scrub is vegan, sulfate-free, and paraben-free. It works well on all skin types, even problem skin. It's an Amazon best-seller, an Allure "Best of Beauty" Award Winner, and a Birchbox favorite. It also has more than 1,000 five-star reviews on Amazon. The Aveeno Positively Radiant Skin Brightening Exfoliating Daily Scrub can help improve skin tone, texture, and clarity. It uses moisture-rich natural soy extract to transform dull, uneven skin into brighter, smoother, more radiant-looking skin. The naturally derived granules gently exfoliate while you cleanse for more even tone and texture. This is oil-free, soap-free, non-comedogenic, hypoallergenic, and safe for everyday use, even on sensitive skin. It's recommended by Glamour and has outstanding online reviews, including more than 1,100 five-star reviews on Influenster and more than 500 five-star reviews on Amazon. 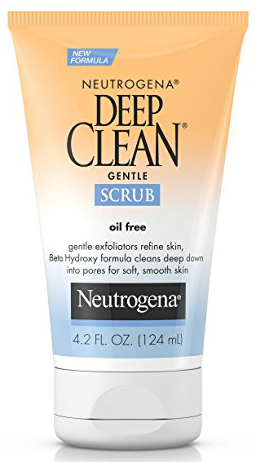 The Neutrogena Deep Clean Gentle Face Scrub is oil-free and non-comedogenic scrub, making it the perfect choice for just about any skin type, from sensitive to acne-prone skin. Beta hydroxy acid cleans deep down to pores to remove dirt, oil, and makeup for soft, smooth skin. The rich, creamy scrub gently exfoliates away dull, dead surface skin cells and rinses clean. This daily scrub can start transforming skin after just one use. It comes from the #1 dermatologist-recommended skin care brand and has outstanding online reviews. And those are our recommendations for the best face scrubs. As always, be sure to check Wise Bread's Buying Calendar to learn when and how to buy just about anything!